Our Spring Tests allow you to experience an online examination in the real-time environment. In every online test on Spring, you will be presented with Multiple Choice Questions (MCQs) which will test your skills in Spring Concepts in a detailed and comprehensive manner. In the test, each question will have 4 options to choose from. You should select only 1 correct option as an answer and then move on to the next question. Once you submit answers to all the questions, you will be given your final test score. In the Online Spring Test, for every correct answer, you will be given 2 points. There will also be negative marking of -1 for every wrong answer. So, you will have to be more careful in choosing the answers to the question in your online examination. If needed, you should skip to the next question and come back to the previous question later so that you can do proper time management for the online mock tests. 1. "Spring Practice Tests" - In Spring practice tests, there will be a series of practice tests wherein you can test your Spring concepts on every chapter separately. There will not be any time limit on these tests. So, Spring Practice Tests should be the first set of tests which you should attempt. Goto these practice tests here. 2. "Spring Mock Tests" - In Spring mock tests, there will be a series of mock tests wherein you can test your Spring concepts on every chapter separately, but there will be a fixed time limit per test. So, it is similar to Spring Practice Tests, but with an added constraint of time limits. You should try Spring Mock Tests if you are appearing for any online examination soon. Goto these mock tests here. 3. 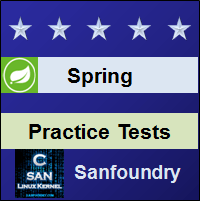 "Spring Certification Test" - Once you are through with your Spring concepts, then you should try our Spring Certification Test wherein Sanfoundry will issue a free Certificate to you if you scored either Grade A* or Grade A in Spring Certification Test. Goto Spring Certification test here. 4. "Spring Internship Test" - If you are interested to do Internships in Spring at Sanfoundry, then you must take our Spring Internship Test. If you scored either Grade A* or Grade A in Spring Internship Test, then you are eligible for Internship at Sanfoundry in Spring. Goto Spring Internship test here. 5. "Spring Job Test" - If you are a fresher, a dropout, an experienced person and if you know Spring well and looking out for jobs in Spring domain at Sanfoundry (or our Network of Companies), then you should try and qualify our "Spring Job Test". 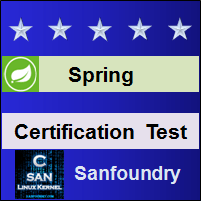 If you scored either Grade A* or Grade A in Spring Job Test, then you are eligible for a Job at Sanfoundry (or our Network) in Spring domain. Goto Spring Job test here. For every "Spring Practice Test", Total Questions: 20, Total Time: Unlimited. For every "Spring Mock Test", Total Questions: 20, Total Time: 20 Minutes. For "Spring Certification Test", Total Questions: 50, Total Time: 1 hour. For "Spring Internship Test", Total Questions: 50, Total Time: 1 hour. For "Spring Job Test", Total Questions: 50, Total Time: 1 hour. Before you get started on these series of online tests on Spring, you should learn, study and practice our collection of 1000 MCQs (Multiple Choice Questions and Answers) on Spring here. We also prefer that you should practice Spring practice tests and mock tests completely before attempting the certification test. Here is the list of online practice tests and mock tests on Spring. Each online test focuses on a "Specific chapter of Spring". So, you should try both practice test and mock test on every chapter to do a self-assessment of your knowledge (along with time-limit constraints) in every area or sub-topic of Spring. Spring Certification test, Internship test, and Job Test are mentioned at the end of this list. 1. Spring Test 1 – This set of online test on “Spring” tests your skills on Creating Beans, Declaring Beans, Bean Scopes, Bean Post Processors, Property Editors & Task Executors in Spring, AspectJ Annotation, Pointcut Definitions. 2. Spring Test 2 – This set of online test on “Spring” tests your skills on Introducing Behaviors & States to Beans, AspectJ Aspects, Implementing & Injecting Beans with Scripting Languages, Refreshing & Defining Beans from Scripts, Securing URL Access, Securing Web Applications, Handling Security in Views & Domain object security. 3. Spring Test 3 – This set of online test on “Spring” tests your skills on Accessing & Integrating Spring with Frameworks, Managing Web Flows, Securing & persisting objects in Web Flows, Integrating Spring Web Flow with JSF, Spring MVC Web Applications & Requests handlers, User Locales & Locale-Sensitive Text Messages, Views Mapping & Handling. 4. 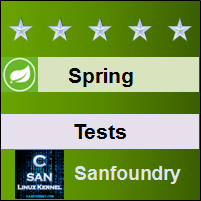 Spring Test 4 – This set of online test on “Spring” tests your skills on Bean validation, creating excel & pdf, REST Service with Spring, JSON with REST, Flex & Sandbox in Spring, Spring BlazeDS support, Grails Application & Plug ins, Application’s Domain Classes. 5. Spring Test 5 – This set of online test on “Spring” tests your skills on Internationalization (I18n) Message Properties & Storage Properties, Logging & Unit Testing, Custom Layouts,Tags & Templates, Spring Roo, SpringSource Tool Suite, Unit Testing Spring, Integration Testing. 6. Spring Test 6 – This set of online test on “Spring” tests your skills on Spring Portlet MVC, Problems with Direct JDBC, JDBC Template, Simple JDBC Template & Handling Exceptions, ORM Frameworks, Hibernate’s & JPA’s Contextual Sessions, Transaction Management. 7. Spring Test 7 – This set of online test on “Spring” tests your skills on Setting the Transaction Attribute, EJB 2.x with Spring, EJB 3.0 with Spring, SOAP Web Service, Spring Web Services, Web Services with XML Marshalling & service end points, JMX MBeans. 8. 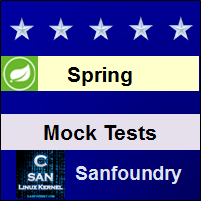 Spring Test 8 – This set of online test on “Spring” tests your skills on E-mail & scheduling with Spring Support, JMS Messages & Transactions, Message-Driven POJOs in Spring & making connection, Integration of Systems, Transformation & Error handling, Splitters, Aggregators & Routing, Spring Batch & Gateways. 9. Spring Test 9 – This set of online test on “Spring” tests your skills on Spring Batch’s infrastructure, Reading & Writing, Transactions & Retrying, Controlling Step Execution & Job, Clustering Object State Using Terracotta & Execution to a Grid, Parallelizing Processing & Load Balancing, Workflow Models & jBPM, Integrating jBPM 4. 10. Spring Test 10 – This set of online test on “Spring” tests your skills on Building a Service & Business Process with Spring, Getting Started with OSGi, Spring Dynamic Modules, SpringSource dm Server & Toolings, Serialization in Java, Java Send Email API. 11. Spring Certification Test - This set of online free certification test on "Spring" tests your skills on all areas (all chapters, topics and subtopics) of Spring. 12. 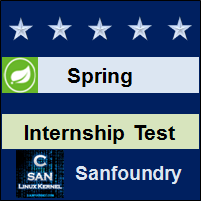 Spring Internship Test - If you scored either Grade A* or Grade A in our Spring Internship Test, then you can apply for Internship at Sanfoundry in Spring. 13. 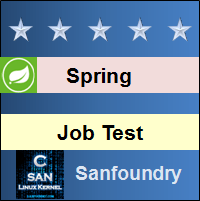 Spring Job Test - If you scored either Grade A* or Grade A in our Spring Job Test, then you can apply for Jobs at Sanfoundry in Spring domain. Best Wishes for your Spring Tests!